I am sure the clerk at the shoe store did not anticipate the look of sheer horror on my face as he answered my question. “No ma’am, we do not carry shoes that size with Velcro closure.” My heart began to race and out of the corner of my eye I could see Noah’s wrists begin that small wringing motion that accompanies his anxiety. I always knew the day would come when his foot would outgrow our long trusted accommodation for not being able to tie shoes. Each year I have offered the silent (and sometimes vocal) prayer: God bless you for Velcro. But not this year. With all the calmness I could muster I turned to Noah and announced that it was time we conquered shoe tying. He was appropriately mortified. I asked him to pick out shoes of any color that he liked. His response was, “I don’t know. I don’t care. 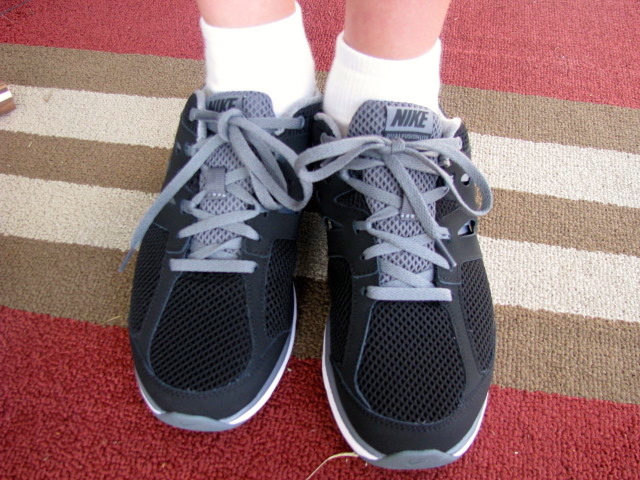 There is no Velcro.” This was cycle was repeated about 5 times among the crowded aisles of new smelling shoes. My stomach churned. When your child is developmentally delayed, you learn to carefully select which “hill you are going to die on” as far as acquiring skills. For instance, while most children were proudly learning how to tie their shoes, we were still mastering potty training and learning to speak. It simply did not make sense to add shoe tying to a list of things we needed to learn at that time. At that time, I assumed we would pick up that skill later. But, I confess, as years passed I grew doubtful that we would ever attain this goal. There just seemed to be some disconnect that prevented Noah from being able to see the steps and transfer them to the fine motor movements required to make the laces obey. And I, working on many other skills that did not have a ready accommodation like Velcro, chose to let that milestone pass us. As a matter of fact, it was so far in the distance that I had forgotten about it until that unfortunate day in the shoe store. I write this for the parents of so many “delayed” children who easily identify with watching a milestone pass you by. I remember the pain as so many of my friends commemorated milestones in baby books and scrapbooks that I wasn’t sure we could ever hope to celebrate. You make a kind of peace with it, knowing you can’t make those events happen and you try to push those to the back of your mind. Today I have good news for you. Delayed doesn’t mean you will never reach your destination – it just means you will be arriving by a different route and on a different timetable. If a flight or train is delayed, we don’t automatically assume that it will never come and that we will NEVER see our loved ones. We are discouraged but not desperate and without hope. Instead we settle in for a wait and try to amuse ourselves for the duration of the postponement. Somehow, that message isn’t always conveyed when we discuss developmental delays in people. I know how easy it is to get discouraged. I realize that it may even be a valuable part of the grieving process to “give up” on certain goals in the name of acceptance and sound mental health. But I also know that delay doesn’t mean inevitable defeat. Time can be kinder than we initially assume and some of us just need a little more of it to reach our destination. Noah learned how to tie his shoes in just a few hours this weekend. He proudly announced, “I can do it now! And it isn’t even so hard this time.” It was an admission that while he could not accomplish this goal just a few years ago, now his brain has advanced to a different stage making it not so hard “this time.” At 12 years of age, we have finally learned to tie our shoes. “Now arriving at Platform 12…Shoe Tying…” There has not been a victory so sweet in a long time. Perhaps this is because this speaks to all of us. So many of us thought we’d be further along by now. Maybe you thought you would have advanced further in your vocation at this point in your life. Or maybe you are still waiting on an interview after months and months of searching for a job. Or you might have an inner struggle or physical illness from which you have been awaiting healing yet still no healing comes. You have been delayed. Faithfully you wait on a day when it either won’t hurt so much – or it just won’t matter. Until then you put your life together with Velcro and do your best to get on with your life. But you still experience the pain of delay. This weekend, Noah taught me to have the faith to still watch the tracks for the arrival of that delayed train. I keep my ear attuned for the sound of a blessed whistle that will announce the advent of deliverance from hopelessness. No, a delay doesn’t mean inevitable defeat. We must simply find the faith to wait. God bless the hands that tied these shoes. You enabled his fingers to acquire this skill at just the right time. I praise you for your faithfulness! Guide these hands today as he learns even more new things. Bless these hands to serve others. Direct the path his feet will take today. Bring us ever closer to you. Amen. Delay does not mean defeat. But sometimes, we have to accept limitations. There can be a limit, and it is okay. My oldest daughter has been turned down twice for learning to drive. At 27, she has set her mind to make use of the bus system, and to look for jobs on the bus line (or that we can take her to.